You’re a massive Andrew Benintendi fan and love to dress up in his gear, so since you have a new baseball fan in your life, you want to share your enthusiasm with him. 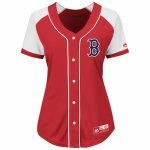 Now you can do just that when you get him this Andrew Benintendi Boston Red Sox Home Official Cool Base Player jersey from Majestic. It features amazing Boston Red Sox graphics all over the front and back while the built-in Cool Base technology will keep him comfortable.